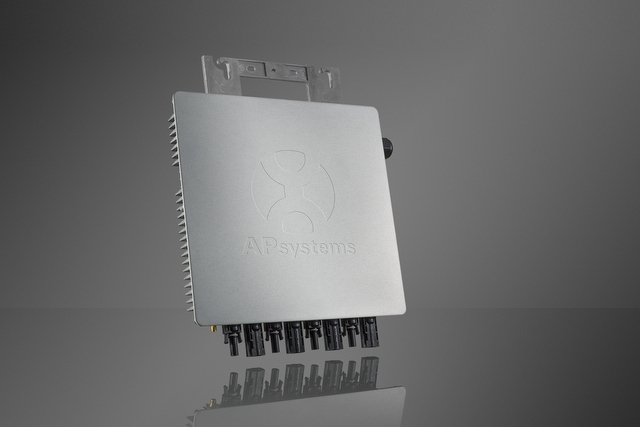 APsystems boasts an industry best-selling 3-phase solar microinverter and the industry’s ﬁrst true 3-phase (phase-balanced & phase-monitored) unit, the YC1000-3. This model handles 208V or 277Y/480V grid voltages with 900 watts maximum output, 95 percent peak efficiency and comes with ZigBee communication and integrated ground. At 480V up to 11 units (44 modules total, 60- or 72-cell) can be linked in a single 15A circuit, and up to 14 solar modules (7x YC500s) in a string with a 20A breaker. Designed to operate from -40 F to 149 F degrees. Ten and 25-year warranties are available. Booth 9245. A new 290-W, 60-cell polycrystalline diamond-cut PERC solar module is one of the newest products from Boviet Solar’s full PERC production line completed in 2016. Also on display will be the new 300-W monocrystalline PERC Smart Module designed to harvest 25 percent more energy. In addition to free, 24-hour monitoring per module, the Smart Module also has module-level voltage shutdown to offer greater installer and firefighter safety. Booth 8317. Ciel et Terre: Making floating PV happen in the U.S.
Ciel et Terre has completed large-scale floating PV systems in various market applications and countries, showcasing FPV as a real alternative to traditional PV in roof-top and ground-mounted systems. 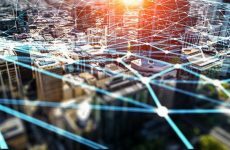 In the past year, the organization increased its U.S. reach with its first public utility project in Orlando, alongside its local Florida representative D3 Energy and in partnership with the Orlando Utilities Commission. 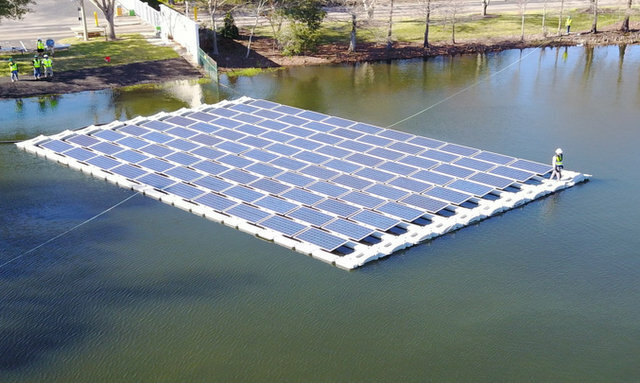 Ciel et Terre installed a 31.5-kWp floating solar system on the OUC’s storm water storage reservoir, a dead water space at the facility, and is expected to generate up to 51,000 kWh per year. Booths 9744 and 9745. Designed for critical applications requiring secure, efficient and reliable power, Eaton’s newest solution is engineered to deploy stand-alone power systems using existing and new assets with the adaptability to easily meet future needs. 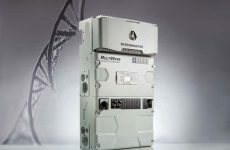 The system incorporates Eaton’s new Power Xpert energy optimizer controller and provides a modular, scalable approach to microgrid control, as well as accompanying services, such as microgrid feasibility studies, total system design, control system deployment, integration with existing third-party generation assets and critical loads, project implementation, commissioning and system start-up, and ongoing maintenance. Booth 8310. EcoFasten Solar has launched its newest product, SimpleBlock, a solution designed specifically for standing seam metal roofing applications. The versatile SimpleBlock provides a variety of options through compatibility with any rack manufacturer’s connection points (L-feet, posts), and will fit any double-lock standing seam. When used in conjunction with EcoFasten’s Mid-Clamp, SimpleBlock becomes a rail-free racking system featuring integrated bonding. The system meets and exceeds all known building codes and is UL 2703 listed, with product compliance determined through rigorous, uncompromised testing per UL 2703: First Edition. Due to such an overwhelming response to this innovative system, EcoFasten Solar is gearing up for high volume manufacturing to meet industry demand and will also be unveiling additional configurations for more seam options soon. Booth 9433. Fronius introduces its next generation of solar systems to the industry, the Fronius Smart Solution. This satisfies all needs for residential and commercial systems: flexible system design, shade mitigation, NEC compliance, high performance and state-of-the art monitoring while keeping the number of components low and installation easy. The Fronius Smart Solution combines the benefits of traditional MLPE such as microinverters or DC optimizers with the ease of installation and cost-effectiveness of string inverters. 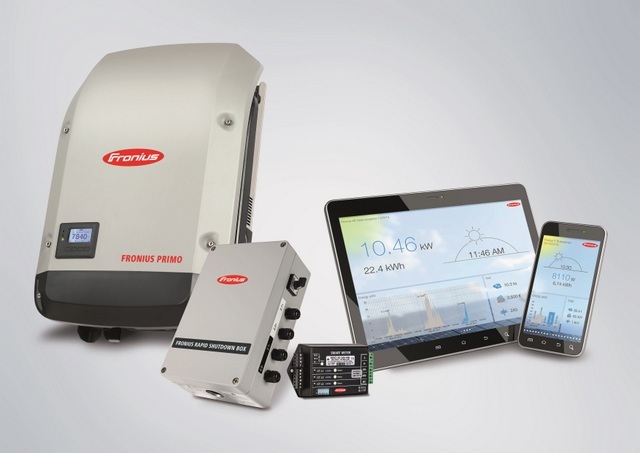 The Fronius Smart Solution is the combination of cell-string optimized modules, the Fronius Rapid Shutdown Box, a Fronius SnapINverter, the optional Fronius Smart Meter and the Fronius Solar.web online monitoring portal. Check it out for yourself at the Fortune Energy booth. Booth 8519. 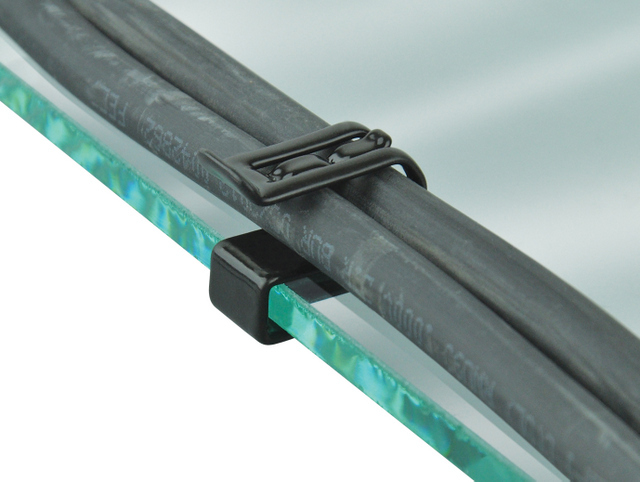 Heyco’s new Edge Clips are ideal for use where holes cannot be used and adhesives are not acceptable due to temperature issues. If these won’t work, check out Heyco’s new SunRunner Vidrios, which are designed to mount directly onto the glass panel with compression force only — perfect for frameless PV modules. If neither of those pique your interest, check out Heyco’s SunBundler. Though not new to Heyco’s offering, the Heyco SunBundler has been receiving a lot of attention due to its 20 year warranty and unique design. Check them out at the CED Greentech booth. Booth 8311. 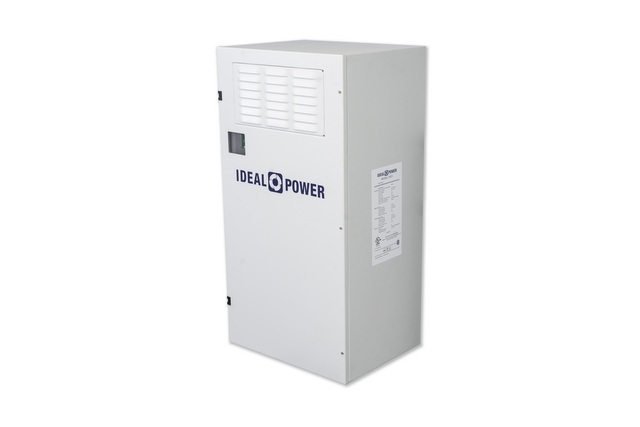 Ideal Power’s newest Stabiliti Series power conversion system is a grid-resilient 30-kW advanced power conversion system for system integrators and project developers who need to efficiently connect distributed energy resources to the grid. Stabiliti is the next generation of Ideal Power’s patented Power Packet Switching Architecture (PPSA) technology and incorporates numerous new features and benefits for commercial and industrial customers. The Stabiliti Series is available in two versions: dual port AC-DC bi-directional and multi-port AC-DC-DC bi-directional. Ideal Power’s John Merritt will be speaking on July 10 from 12-12.30 p.m. at the ‘‘Islands, Mini-Grids, Microgrids & Energy Storage’’ session. His talk will explain how solar-plus-storage systems can become microgrid-enabled with multi-port conversion technologies, creating energy resilience and reducing reliance on backup generators. Booth 8110. 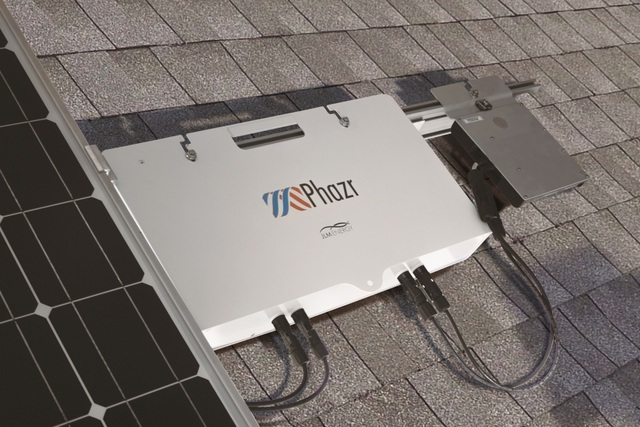 Phazr, the first in JLM’s MicroStorage family of products, is mounted seamlessly behind the solar panel. Phazr is designed for large-scale, solar-plus-storage applications and is also perfectly suited for smaller residential and commercial installs. The simultaneous nature of electron flow is unique to JLM’s patent-pending technology. This is included in JLM’s energy technology bundle and is operated by Measurz software, which continually observes energy usage patterns and utilizes a variety of strategies to maintain a pre-set budget determined by the customer. Booth 8134. 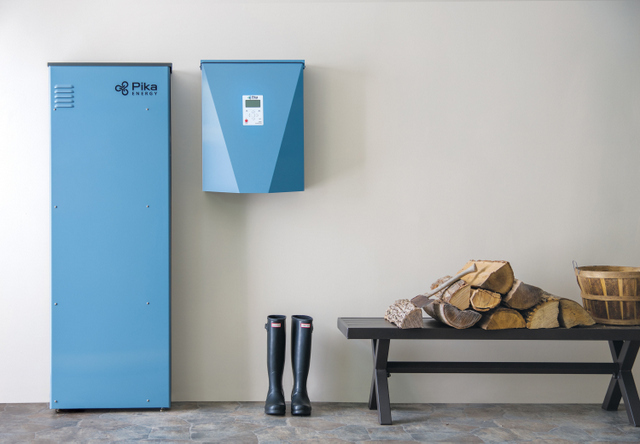 Panasonic Eco Solutions North America and U.S.-based inverter manufacturer Pika Energy Inc. are partnering to offer a DC-coupled solar smart battery — Harbor 10P/15P — that will begin shipping in late 2017 and is available for pre-order today. 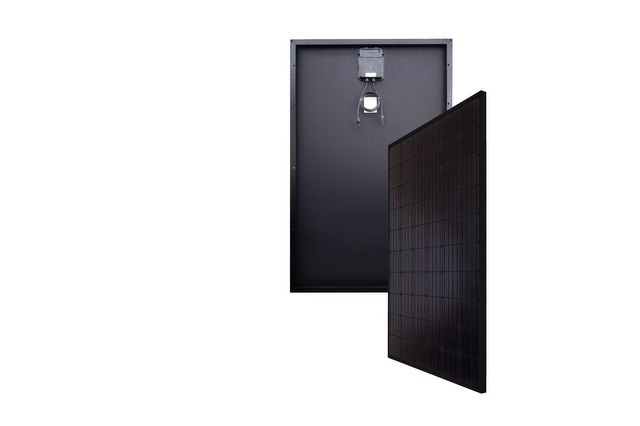 The solar-ready Harbor Smart Battery combines Panasonic’s Lithium-Ion battery modules and Pika Energy’s power electronics in a slim, floor-standing, wall-mounted enclosure to provides 10 kWh or 15 kWh of usable energy and up to 6.7 kW of continuous power. Booth 8318. 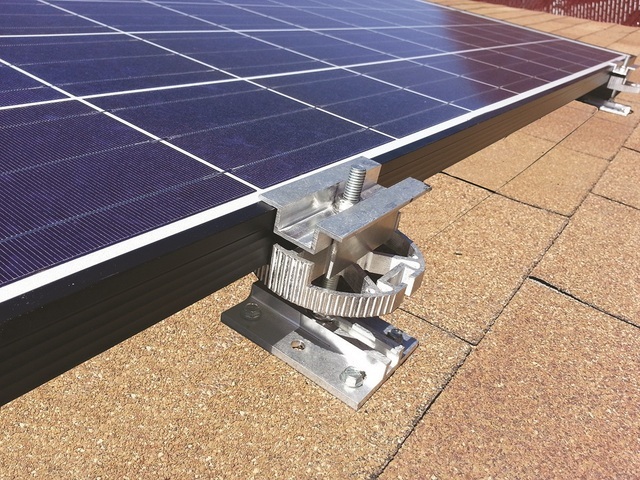 Maneuvering mounting rails can be the most demanding part of installing rooftop solar modules. But now installers can avoid that — and mount modules faster and easier — with the POWER DISK rail-less mounting system from Preformed Line Products. POWER DISK is a unique roof attachment that can go anywhere on residential rooftops. It does not need to be secured to rafters. Install solar modules in four simple steps: 1. Snap chalk lines. 2. Mount POWER DISK bases anywhere on the roof deck. 3. Set solar modules in place. 4. Spin the disks to vertically adjust height to roof undulations. Booth 9449. 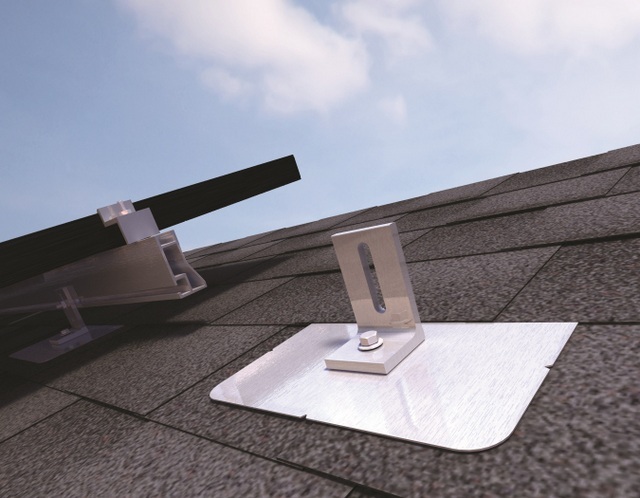 Quick Mount PV engineered its patented Elevated Water Seal Technology into an integrated L-foot and flashing for cost-effective, super-fast, single-bolt installation with unparalleled waterproofing. The L-Mount Series comes in single- and double-slot options for maximum versatility and works with all leading racks. 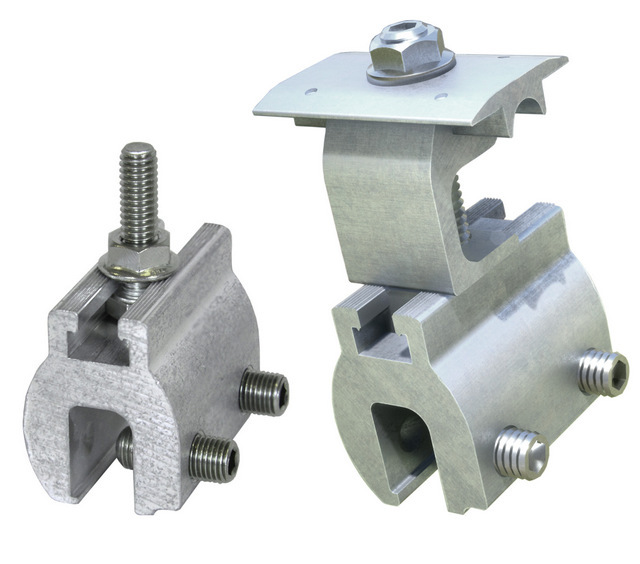 L-Mounts are designed for simple lag-bolt installation onto existing composition/asphalt shingle roofs. The L-Mount features a 9-in. by 12-in. aluminum flashing with alignment notches and rounded corners to easily slide under shingles and speed installation. No shingle cutting required. Like all Quick Mount PV products, the L-Mount meets or exceeds roofing industry best practices and comes with a 25-year warranty. Available in mill or black finish. Booth 9411. RBI Solar is one of the top turn-key solar mounting solutions suppliers in the United States for ground mount, ballasted landfills, roof mounts and canopy/carport structures. As a single-source provider for commercial and utility-scale PV projects, all responsibility for the design, engineering, manufacturing and installation of the most efficient PV Racking systems in the marketplace is completed in-house by the RBI Solar Team. Committed to providing value from conception to completion, RBI Solar’s customers receive cost-effective and durable racking solutions for each project site to aide in reducing the overall project costs. Booth L9008. 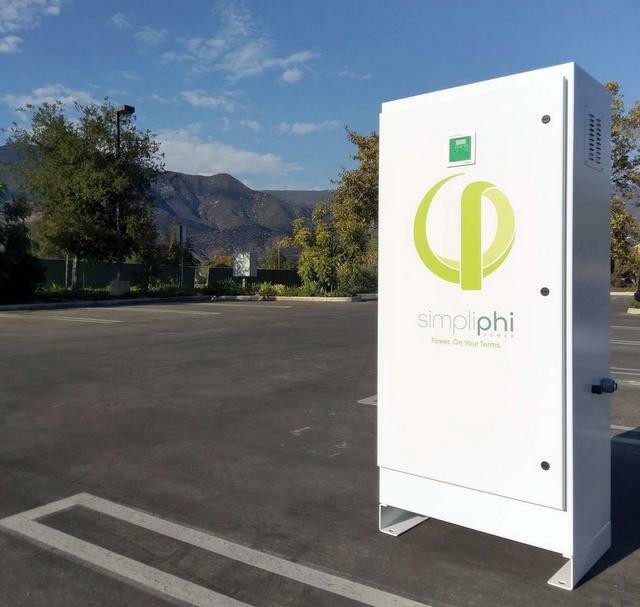 Developed in partnership with installers, SimpliPhi Power’s AccESS has been installed in a variety of locations, including a commercial “glamping” resort, Flying Flags, and is positioned for hundreds of residential installations in partnership with Civic Solar’s SGIP projects. The AccESS provides power security that is safe, reliable, non-hazardous and efficient. The fully integrated solution includes the SimpliPhi award-winning battery technology, Schneider Electric inverter charge controller, associated power electronics and overall system management. Pre-programmed software settings and performance monitoring complete the solution. Booth 8124. 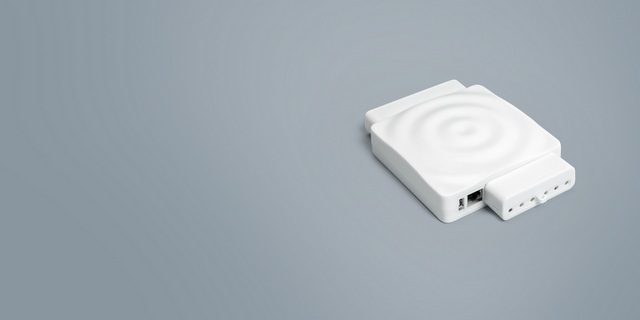 Now entering the U.S. solar market, Smappee Plus is the latest innovation from Smappee’s burgeoning energy monitoring solutions which have seen widespread adoption across Europe since 2012. The product combines Smappee’s patented NILM (Non-Intrusive Load Monitoring) technology with submetering clamps to measure real-time energy use from appliances throughout a user’s home including those with variable output or similar energy consumption patterns, giving previously undetectable transparency to energy use. Head to the Impress Lounge across the street from the Moscone Center for more info. Solar-Log’s new WEB Enerest is an enhanced PV monitoring portal that works in combination with Solar-Log’s data loggers to offer better monitoring and more efficient optimization of solar power usage. The new Solar-Log WEB Enerest portal is available in three different service levels and price classes to respond even more precisely to the differing needs of individual customer groups. The most advanced XL package allows installers and service providers to centrally monitor their entire fleet from one portal. This premium version provides near real-time visualization of plant error messages which can be quickly evaluated and managed. The portal allows the operator to remotely configure the Solar-Log®device, customize the portal design, and define plant owners’ access to the yield and plant information. Automated reports, integrated weather data comparison and the option to combine several plants with one account are just some of the comprehensive functions. Booth 9121. The concept is simple: Replace traditional metal and fabric awnings with solar-power-generating panels that provide necessary protection from the elements while also replacing traditional electricity usage. That concept is coming to the marketplace as the SunShield awning system. It is being introduced by SunModo, a company that makes durable, easy-to-install professional racking systems. 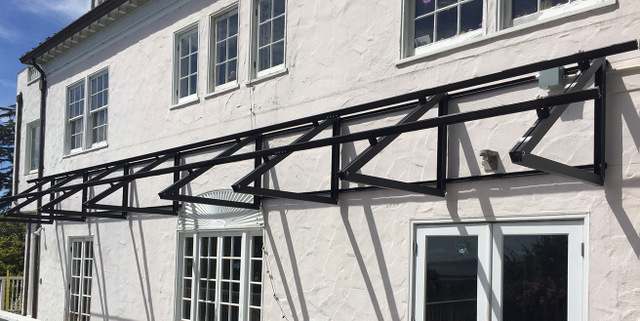 The SunShield awning system features a durable triangular aluminum frame as structural truss; and expands to a 35-degree tilt angle once installed. This compact triangle frame design easily accommodates both 60 and 72 cell solar panels. What’s more, SunShield opens the awning industry to 30 percent tax credits and provides a substantial new canvas for solar power generation. Booth 9539. Originally launched in the United States at Intersolar 2015, Tabuchi America is debuting the 2nd generation model of its Eco Intelligent Battery System (EIBS). Tabuchi’s all-in-one, easy-to-install system includes a 5.5-kW solar inverter and stackable 6-kWh lithium-ion batteries. The Tabuchi EIBS has the intelligence to maximize a homeowner’s savings in real time across different electricity tariffs. This DC-coupled system will meet advanced inverter requirements and will be 9540 compliant. Booth 8121. 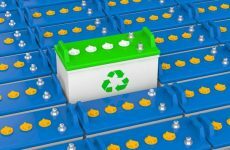 Trojan Battery Co. is launching a new line of maintenance-free, true deep-cycle absorbent glass mat (AGM) batteries specifically designed for solar and other renewable energy applications. 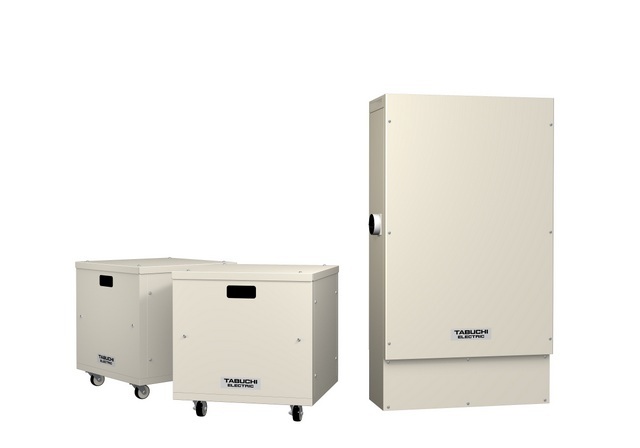 The new Trojan Solar AGM line is manufactured in the U.S. Offering a three-year warranty for stationary applications, and tested to an eight-year design life under IEC 61427 standard for solar batteries, this initial release includes a wide range of Trojan Solar AGM models. 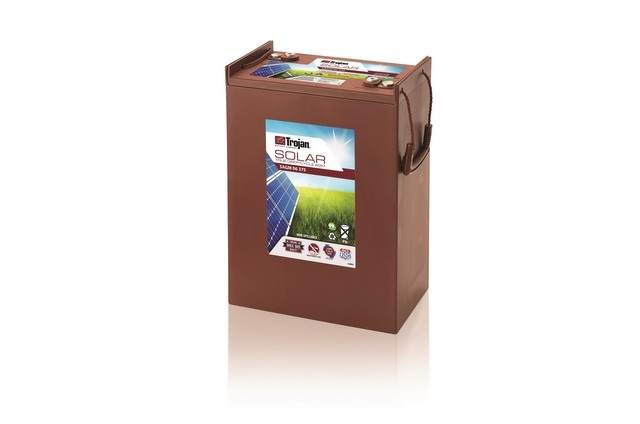 With its non-spillable design, the new Trojan Solar AGM batteries enable installers to customize the use and position of the batteries in customer applications. Booth 8128.